The only thing I could remember about John Tyler before I began this journey was that he was the first vice president to take over for a chief executive who died in office. Other than that, I didn’t know he was from Virginia (about 90 minutes from where I currently live, so you know I’m planning a visit). I wasn’t aware he had anything in common with John Quincy Adams (they were both successful politicians prior to becoming president, at which point their political instincts quickly vanished). And I had no idea his grandson is still alive and well, and living at former President Tyler’s estate, Sherwood Forest Plantation near Richmond, Virginia. 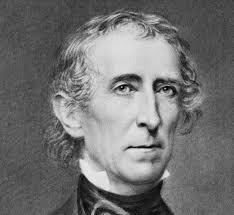 In case that didn’t sink in – John Tyler was president over 170 years ago and his grandson is alive! The first biography of John Tyler I’m reading is the 1939 classic by Oliver Perry Chitwood “John Tyler: Champion of the Old South.” I’m not sure whether it was coincidental, or cleverly planned, that this biography of the tenth president was published the same year as Freeman Cleaves’s biography of the ninth president (William Henry Harrison). But happily for me, this biography by Chitwood seems to have delighted slightly more of its readership than did Cleaves’s biography of Harrison. I’m now two-thirds of the way through Chitwood’s biography of Tyler and surprised at how much I’m enjoying it – so stay tuned. Next up will be Edward Crapol’s biography “John Tyler: The Accidental President” published in 2006. Crapol is Professor Emeritus of American History at the College of William and Mary (which happens to be John Tyler’s alma matter). The book’s final chapter is “Conclusion: Precedents & Legacies” which sounds like the perfect title for a concluding chapter in a presidential biography…so I’m hopeful this book outshines its somewhat flat reviews. The third and final biography of John Tyler I’m reading is “John Tyler” by Gary May which was published in 2008 and is the first book I will have read which is part of The Americans Presidents series. Many of the biographies in this collection seem too short and pithy to offer compelling studies of their subjects, and few seem known for being outstanding. But May’s biography ended up in my library, so I’ll give it a read. Reviewers seem to appreciate this biography above the others on Tyler, so I’ll be interested to put that to the test. Interestingly, I actually did know his grandchild was still alive – I heard that a few months ago somewhere. And believe me, I went and did the math and followed the descendants out. Pretty crazy to think about.